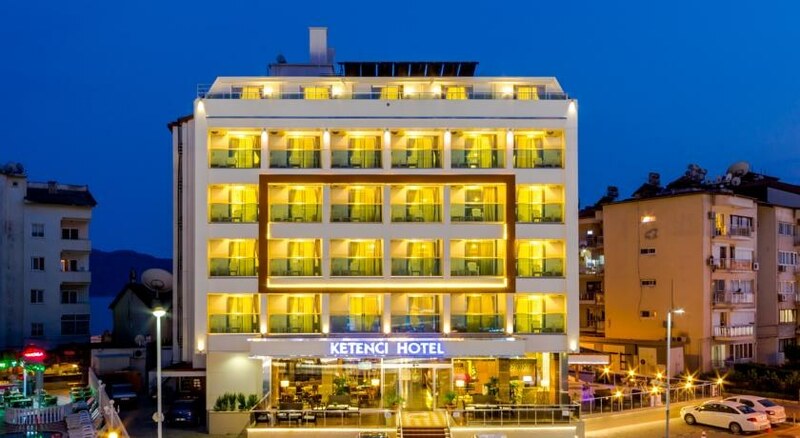 The south coast of Turkey is home to the affordable Ketenci Hotel, situated in an urban area 1km from the resort centre of Marmaris, centred amid the man-made beach and amenities and leisure facilities. The medium-size Ketenci Hotel has 56 comfortable rooms and fuels your fun day with a hearty breakfast buffet, offers a la carte restaurant dishes and provides a pool bar and lobby bar for snacks and refreshments. You can relax around the small outdoor pool with terrace and garden surrounds, and there is a separate children's pool. All the essentials are here for a great value stay in touch with the cosmopolitan resort of Marmaris on the south coast of Turkey; book into the Ketenci Hotel and make the most of your hard-earned budget. Getting to the hotel: 90km from Dalaman International Airport. Local tips: Otobüs Duragi bus station is a 2-minute walk from the hotel. There are plenty of restaurants, cafes, bars and shops in the surrounding area. Food, drink and entertainment: A compact restaurant serves a breakfast buffet each morning, an a la carte restaurant offers meal options and there is a pool bar for snacks and refreshments and a lobby bar for beverages. Sport, games and activities: A small swimming pool, sun terrace and gardens with sun beds and umbrellas; table games; and the man-made beach is only 30m away. Additional: 24 hour Reception Services, housekeeping, free WiFi internet in public areas, room service, fax & copy service, air-conditioning, lift and free onsite parking is possible. Guest rooms; Standard with a land view, combine comfort and functionality with soft pale interiors, drapes and fabrics of warm colour and fresh pastel tones, furnishings on cool tiled or smooth hard wood flooring for comfort and modern amenities for your convenience; features include a private balcony, individually controlled air-conditioning (local charge), private bathroom with half-bath and shower and hair dryer, satellite TV, desk with chair and comfortable seating.